I needed a new cork board. A big one. And here’s why. My fridge is covered in fliers, notes, coupons, schedules, etc. It is one big mess. So I needed to cut down the mess somehow. So I bought an old cork board from the thrift store and covered the frame. 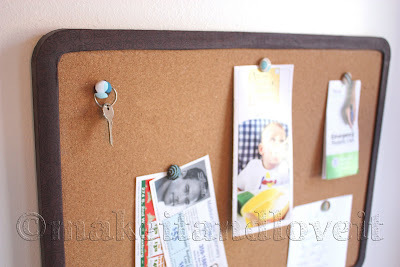 If you’d like to do the same or make your own cork board, use one of my past tutorials here. 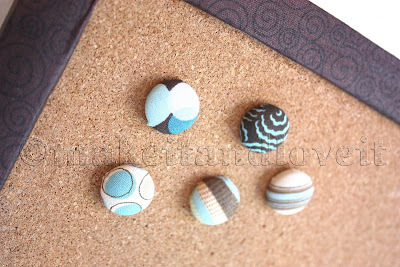 Then I used a tutorial here to make some fabric tacks. Love them. Now it’s time to de-clutter that ‘ol fridge. i did want to ask if the frame has to be flat…I have several frames that have some dimension to them…will it still work or will the fabric get all funky? I found a post to cover the ugly old cork in the frame…kind of like the dry erase board you did. Painting the corkboard is easy peasy too… I love the last post on the strap covers.. just what I need for biking season! i love looking at your website and seeing your projects. you are so creative! i would love to see your house. i’m sure you have cute homemade things EVERYWHERE! Besides the fridge, I have a big paper clip attached to my big wall calendar, which I stuff things into, like invitations & tickets. It's all such a big mess! Thank you for this simple, yet very brilliant, idea! This is exactly what I was googling for! Thanks so much! Now…off to find a frame! I love this idea!!! I also think it’s hilarious that last Friday while I was at Joann’s I almost bought the same fabric that you used in this project! Now I wish I would have!